Iran missiles shipped to Houthis in Yemen seized, displayed by U.S. The U.S. State Department on Nov. 29 displayed what it says is proof that Iran continues to violate UN resolutions which prohibit the Islamic Republic from exporting weapons. During a press conference at Joint Base Anacostia–Bolling in Washington, D.C., the State Department unveiled Iranian missiles that were seized in Yemen and Afghanistan which it said were delivered to, or intended for delivery to, the Houthi rebels and the Taliban, two of Iran’s terror proxies. “Today, the United States is unveiling new evidence of Iran’s ongoing missile proliferation,” said Brian Hook, Senior Policy Advisor to the Secretary of State and Special Representative for Iran. The State Department on Nov. 29 first displayed an Iranian designed and manufactured Sayyad 2C surface-to-air missile. The missile is one of two identical systems interdicted by Saudi Arabia in Yemen earlier this year. The State Department also displayed Toophan and Tosan anti-tank guided missiles that Iran “produces and transfers.” One of the Toophan rockets was seized in an arms cache aboard a dhow in the Arabian Sea. The other was found by Saudi Arabia during a raid in Yemen. “These missiles enhance the Houthis’ capabilities and further intensify the conflict in Yemen,” Hook said. Fajr rockets were also added to the display by the State Department. The weapons were recovered in Helmand, near Kandahar Air Field, by the Afghan National Army from the Taliban. Iran has been providing material support to the Taliban since at least 2007. Fajr rockets have been used by Hamas in the past. 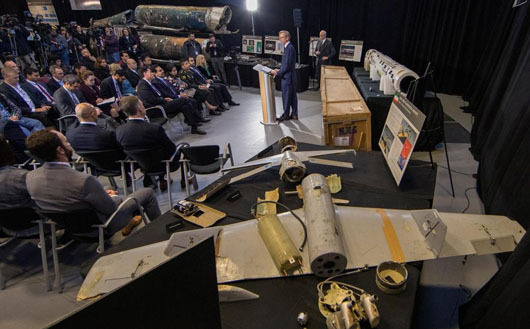 Also displayed was debris from the Shahed 123 missile system, which was recovered by coalition forces in Afghanistan after it crashed, as well as Shahed components that were interdicted in Yemen in early 2018, the State Department said. “This missile system is primarily designed to conduct covert reconnaissance and surveillance missions, potentially putting American and coalition forces at risk,” Hook said. The State Department also displayed what it said were several small arms of Iranian origin, such as sniper rifles, RPGs, AK variants, and hand grenades. The State Department noted that Iran has the largest ballistic missile force in the Middle East, with more than 10 ballistic missile systems either in its inventory or under development.